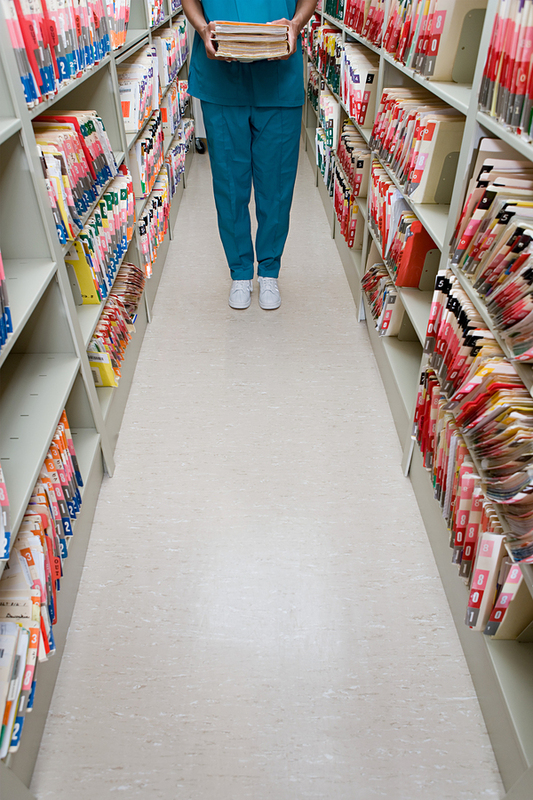 How Should You Be Storing Your Medical Records? There are several ways that you can store your medical records. Whether you choose to store your records onsite, offsite, or in the cloud, security remains of utmost importance. HIPAA requires all medical practices and hospitals to stay up to date on the latest regulations for record management in order to protect individual’s personal information. On Site storage can be beneficial for practices with only a small group of patients. On site storage means the records are stored right at the location. If this method is used, it is extremely important to have someone who manages all the records in order to keep them organized. Offsite storage means the medical records are stored at a different location that the practice or hospital. This ensures security and safety of all of the documents. This is a beneficial option for practices or hospitals that have a lot of documents that are required to be kept for retention under HIPAA. Scanning all of your medical records and storing them on a cloud server is the most convenient way to store your records. Cloud Storage allows you to access the medical records from anywhere with an internet connection. It also makes organizing and categorizing your records very simple. No matter how you choose to store your medical records, security remains a top priority. “As we all know, you can shred paper documents all day, but if a digital version of the document gets into the wrong hands, all that diligence won’t matter,” said intralinks. Record Nations can help with Medical Records Storage.